Hasbro has developed a set of training wheels for Apple’s Video iPod. 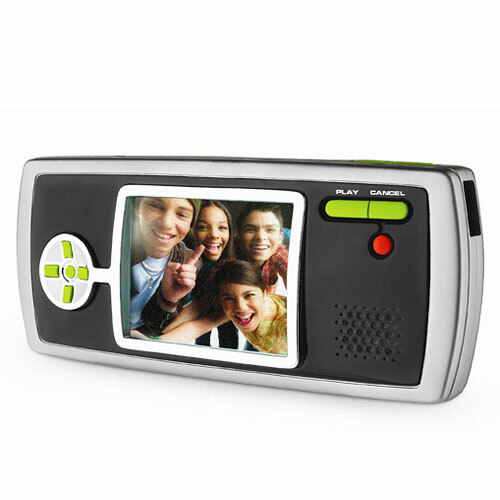 The VuGo portable multimedia center allows tweens to record or download TV shows, music or photos. That media can be recorded from a DVD player or TV, downloaded from a computer, or purchased online through Hasbro’s Tiger Electronics division. VuGo itself is also a portable video player, and thus enable you to bring your videos, your shows, your music and your photos wherever you want. The VuGo supports MP3, MPEG1, AVI, WAV, JPEG, GIF and a few other media formats. The 16-ounce player has a three-inch full color screen and a built-in speaker to enhance the portable experience, and the pop-out stand equals hands-free entertainment. The units have 128 megabytes of memory, which can be expanded to two gigabytes with an SD memory card. The VuGo runs on four AAA batteries. VuGo file management software makes it easy to store and access your VUGO favorites on the computer! Vugo multimedia system available at retails for about $120, but should sell for around $100. Player comes with AV cable, USB cable, software installation CD (PC only) and instructions. Under the distribution deal with Hasbro’s Tiger Electronics division, video downloads from the Cartoon Network and Nickelodeon onto the VuGo Multimedia System run $1.99 or $2.99 per episode. The cartoon offerings range from SpongeBob SquarePants to The Grim Adventures of Billy & Mandy. Boasting 128 MB of virtual memory, the VideoNow VUGO Multimedia System can record or download your favorite TV shows, music or photos. And it’s a cinch to use: just plug it into your DVD, television, satellite receiver or computer, record or download what you want and then view on the go! Features a full-color screen and built-in speaker. 128 MB of virtualy memory; record or download TV shows, music or photos, for up to 1 hour of video, 6 hours of music or 1200 photos.